The thin end of the wedge at Crewe and Bradford: Time to Stop the Gimmicks? It is with great sadness that I report that Royal Mail has followed the lead of Jersey Post and is now using location identifiers in the new Post and Go machines at their Delivery Offices. I've been sent these pictures from the new machine installed at Crewe today (thanks SL) and have no reason to believe that the Bradford ones will not be similar. The 2nd class are MA12 and the 1st class MA13. We reported earlier that the new M series machines would be installed today to replace A003 and A004 which are going to Stampex and then on to new (Museum?) venues. I can now show the Bradford North stamps; the lucky buyer also got a bonus with blanks at the start of his strips. My advice with these would always be to keep them as they are. The first letter of the data string has changed from B to C. Does this mean a third generation of machine? Royal Mail indicate on the back of the Machin Packs that the first letter relates to the reel, so one would expect to see A or B (or C/D at the BPMA) on the printed stamp, but that never seems to have happened. Having to rely on the order printed either on the receipt of the stamp themselves. The Hytech ones used A, the current Royal Mail Series II/IAR ones use B for the first letter of the data string. 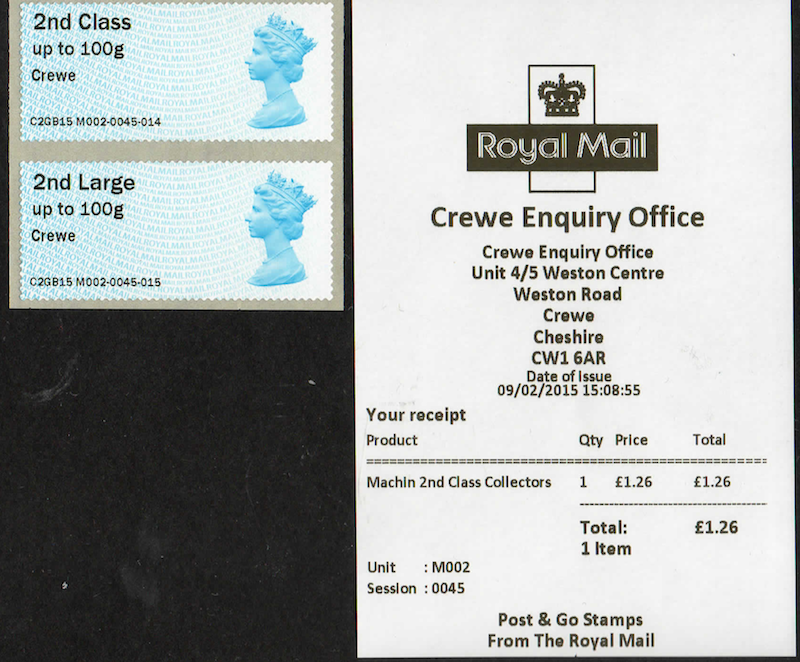 "Royal Mail indicate on the back of the Machin Packs that the first letter relates to the reel, so one would expect to see A or B (or C/D at the BPMA) on the printed stamp, but that never seems to have happened." You are correct, that was the originally stated intention and there has never been any word as to why that did not happen. Oh no! This is the real game-changer - if locations are being printed then collecting all basic overprints is no longer an option. Do they realise this means that folk won't bother with BPMA, Perth, NMRN etc? It is effectively killing the collection of overprints for the rest of the market. At least with Jersey Post they are in Post Offices. I think Jersey PO do not have code location ID numbers so a location name made some sense. I don't think it matters that these are not in Post Offices. 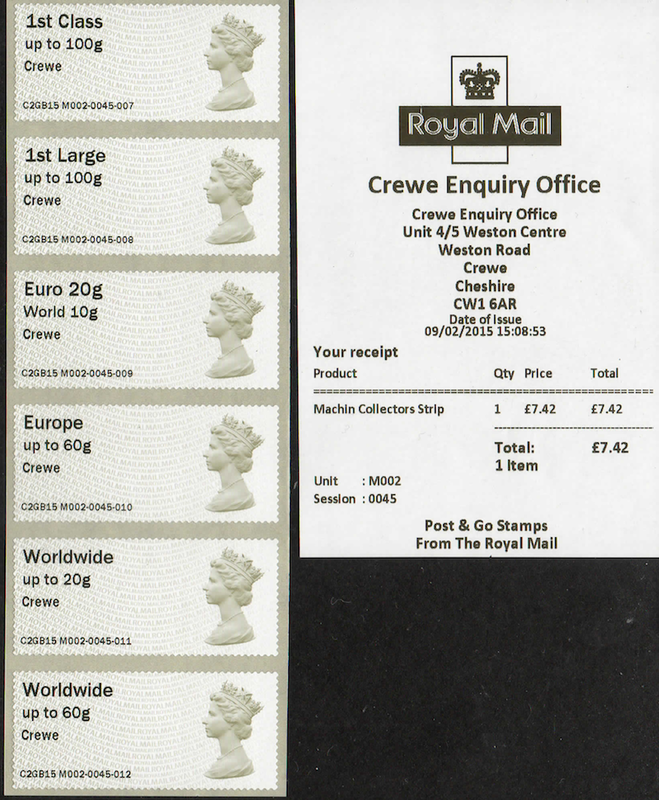 They are in Enquiry Offices which have high volumes of stamps sales, so their placement makes sense. And these also accept payment for postage due and issue a receipt that can then be given to the office staff for collection of the letter / package. But that still doesn't mean that the stamp needs to show where it was issued. Of course many collectors will want at least on example of this variant - I can't imagine many people wanting examples from all offices. This probably means the end of collecting Post and Go varieties by numerous collectors due to increasing costs. Given that there are about 1,350 delivery offices, plus about 50 Mail centers and then there are the Parcelforce depots that could have machines installed, make even having a specimen 1st & 2nd class example costly, if not impossible. Few of the Royal Mail Delivery or Enquiry Offices sell stamps, so the likelihood of them all having Post and Go machines is very low. Likewise, Parcelforce Depots do not use stamps. The position is not good, but nowhere near as bad as some people's imagination suggests ! The fact that you can now have OV stamps has surely surpassed the need to slavishly collect all combinations? One of each design at the 1st Class rate seems to be the best way to go. Good used on piece wil be the better way to go rather than being receipt collectors! To sum it up - the whole Post & Go area can be called 'farcical'. There isn't a week without a new 'must-have' variety and it won't be long we have the day & time printed on the stamps along with the city. As much as I agree with the need for ATM stamps (this is what they are essentially), the sheer abundance of overprints and, in most cases, man-made varieties (be that deliberately or through stupidity) makes this an impossible area to keep up with. I'll stick to what the Tallents House offers, but by all means - collect what you like. I can't see what's changed, but the section about Generic Sheets has also been copied to the relevant post. I was asked to remove the name of the person from the Philatelic Bureau and since I cannot edit my post I had to delete and re-post. Thanks for the explanation. Somebody being super-sensitive? If it had been an image of a letter I suppose they would have wanted it blacked out!